There is a tremendous amount of excitement and exuberance about the American elections tomorrow, but the trends, and recent history in particular, indicate that this excitement is perhaps undeserved. Over the last half century, the United States government has become less and less capable of actually governing the country and doing things, and there is no better example of the trend in action than what the last two years of divided government have produced. Of course, these are just empty assertions without evidence, but evidence we have indeed. What we can see here is that the trend over the last half century has been toward more bloc voting. There’s nothing wrong with bloc voting in itself–in many European countries, political parties routinely bloc vote. However, in those countries the party in government has a guarantee of winning a bloc vote because it has an overall legislative majority. The British Prime Minister is by definition the leader of a voting bloc or coalition of voting blocs that amounts to the majority of the votes in the legislature. In contrast, in the United States the government is routinely divided between an executive branch from one party and one or both of the houses of congress from the opposing party. In the case of the last session of congress, the democrats controlled the presidency and the senate while the republicans controlled the house. Control of the senate is sometimes not even sufficient, because of the senate’s filibuster rules that allows a member of the minority to filibuster to delay a vote indefinitely without a super majority (60 votes) opposing the filibuster. As a resulting, even a united government that controls both houses of congress and the presidency can struggle to get things done against a united opposition party that bloc votes. This proved deadly to the democrats’ ambitions even before the mid-term election after their majority in the senate dipped below sixty with the death of Ted Kennedy, proving to be the bane of Obamacare’s public option. With divided government, it has increasingly become impossible either political party to achieve major political objectives. We’re in a stalemate. There is more or less a steady trend line going downward. 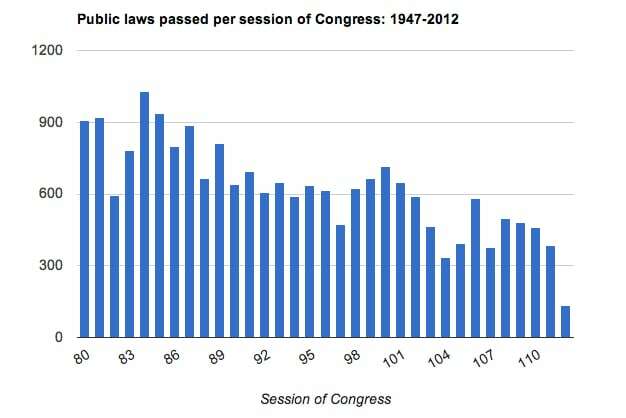 At the time this data was taken, the most recent congress (the blip on the far right of the chart) was three quarters finished, yet had not yet reached even half the level of productivity of the least productive previous session of congress. Why on earth we should expect the result of this election to upend this trend? As we discussed yesterday, Obama is likely to win the election. There’s no chance of a democratic super majority in the senate and the house will probably be retained by the republicans. Even if Romney were to pull of the miracle and get the win, the republicans are unlikely to take the senate, much less grab a super majority there. There is no reason to believe that the next government will be able to achieve any more in the next two years than were achieved in the last two, and aside from an extension of the payroll tax cut, an obvious move during a period of weak job growth, the principle “achievement” of this past session of congress has been to drive the country toward the dreaded fiscal cliff. Where is the change supposed to come from? Is the democracy fairy supposed to descend from the sky and magically empower the next president and the next congress to cooperate? Lots of people would have you believe that this is the most important election in history, for a variety of reasons. Lots of people haven’t been paying attention. No mater which way things go tomorrow, I forecast a stagnant, and ultimately deeply conservative government (not in the reactionary “take us back to the twenties” sense but in the sense that it will preserve the status quo) that acts only in times of obvious emergency. In a wider view, this is quite troubling–we live in a world that’s moving faster, changing faster, and we have a government that is instead getting slower, a government that dithers and squabbles rather than achieves. Sooner or later, that loss of dynamism and adaptability is going to come back to haunt the United States and its people, if it is not doing so already–anaemic growth of jobs and the wider economy in response to the economic crisis likely stems from this very problem, this inability to take decisive action. Remember this? It was not passed right away–in fact, it never went anywhere, and if you think that if it had been Romney up there trying to pass a tax cut for rich people to do the whole trickle down thing, it would have been different, you’re fooling yourself. So don’t get your hopes up–when we look at the American political landscape the day after tomorrow, none of us–democrat or republican–are likely to find anything to get very excited about. There is only one small thing that gives me hope of your being wrong about this. I think there is a possibility of Romney doing a more effective job of working across the aisle, if he so chooses, and if he is not prevented from doing so by the Congressional caucus. Much has been made of the untimely death of Ted Kennedy as an excuse for why President Obama was unable to pass more legislation at the beginning of his first term. I think it is a bigger condemnation of the government that he was unable to convince even a small number of like-minded Republicans to go along with him. This either points to a nearly unprecedented degree of lock-step, bloc voting, as you propose, or a deplorable lack of bipatisanship. Wikipedia says “[The 95th Congress in 1979]was the first time either party held a filibuster-proof 60% super majority in both the Senate and House chambers since the 89th United States Congress in 1965, and last time until the 111th United States Congress in 2009. All three super majorities were Democratic party and also were accompanied by Democratic Presidents.” Both the 95th and the 89th Congress look to be about average compared to the surrounding 5 Congresses in terms of number of bills enacted , neither the rubber-stamping efficiency of a party being able to plow its agenda through nor the stymied inefficiency of the 111th. I’m sure the Republicans understood how the filibuster worked in those years, but either those presidents (Carter and Johnson) were better at garnering bipartisan support, or Republicans were more willing to cross the aisle. I’m not discounting that Tea-Party sentiment could lead to a sharp decline in the latter in the 111th, but I think the Presidents in question were better able to get things done than President Obama has proven to be. Neither of the previous supermajority-holding presidents (again, according to Wikipedia: http://en.wikipedia.org/wiki/Historical_rankings_of_Presidents_of_the_United_States) are consistently ranked in either the top or bottom 10 of the 44 presidents. I realize Wikipedia isn’t the most rigorous of sources, but even without a lot of high-powered research, it seems clear that our current President has struggled. It’s impossible to say whether Romney will be able to do better if, as you say, the power shift only means that the Democrats shift to the obstructionist role. But I find it more likely that Romney, who effectively worked with Democrat majorities in state government, will be able to set a new tone than President Obama will. It will, of course, require a degree of compromise and cooperation that we really haven’t seen much of at all this century (except for the disastrous “No Child Left Behind” Act). That’s where I’m investing my hope for change, though. I tend to go in for the bloc voting theory rather than the Obama was unpersuasive for republicans theory because of the many policies Obama proposed that were, at one time or another, originally republican proposals (the individual mandate was part of Romney’s health care plan and republicans were willing to vote for stimulus and spending increases in the face of large deficits for economic purposes during the Bush administration). If Romney finds more headway, I suspect it will have more to do with democrats tending to be less obstinate when in the minority than with any bipartisanship coming from the republican caucus (even if Mitt is a compromiser, I doubt many congressional republicans will prove to be)–the previous worst performing congresses prior to this last one occurred during Clinton’s second term, with a brief tick upward in work done during the Bush-era congresses.